For my version of the bobble and mesh, I decided to experiment with some Caron One Pound yarn my sister Annie and I picked up a few weeks ago. 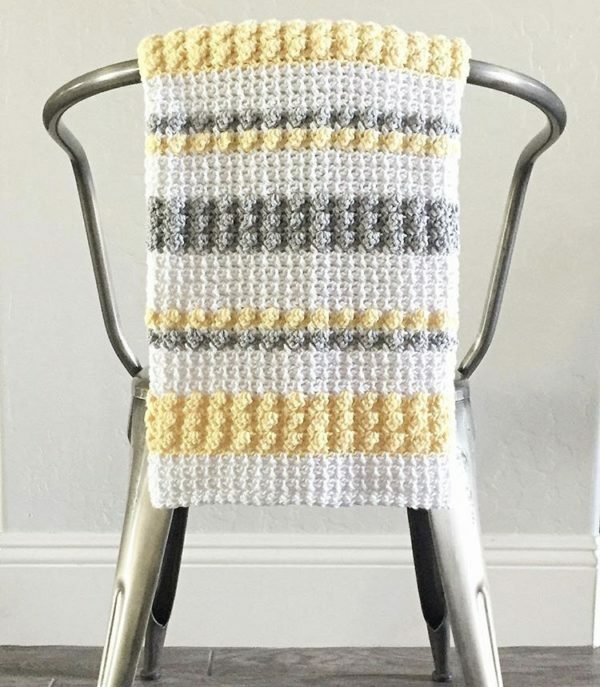 None of us had have worked it with it before, and Annie decided to make a lovely Joanna Gaines inspired baby blanket and I decided to finally try out the bobble and mesh pattern. At first I wasn’t sure if I really liked the One Pound because it doesn’t appear to be quite as soft as some other yarns, but once I started working it I found that it is a great yarn for blankets! I think it’s also a great yarn for beginners because the thicker texture seems to help keep the tension more consistent throughout the blanket. 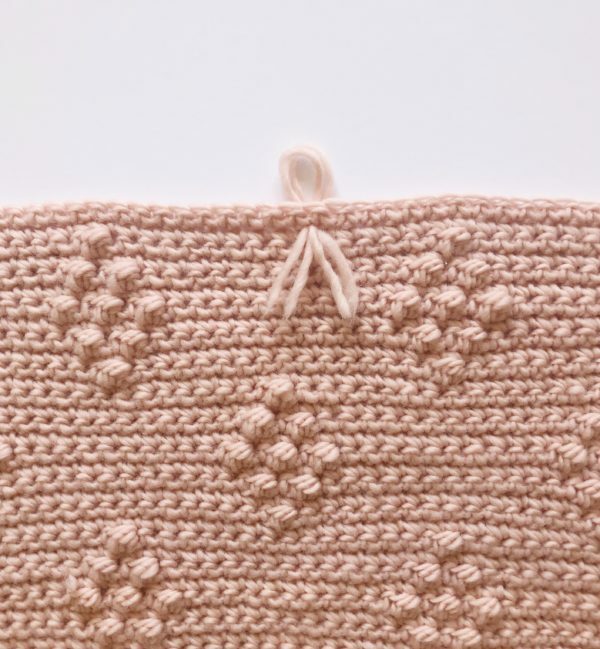 Here is some video help that demonstrates how to work the stitches in this blanket! Start with an even number of chains. SC in the 2nd chain from the hook and CH 1. Skip one chain, then SC, CH 1. Skip the next chain and continue the pattern of SC, CH 1, SK 1 all the way across. Your last stitch in the final chain should be a SC. CH 1 and turn. SC into the SC you just made on the row below. CH 1, skip the chain space, SC into the SC. Repeat the sequence all the way across. Ending again with a SC in the last SC. CH 1 and turn. Yarn over (YO) and pull up a loop, now pull through two (2 loops left on hook). YO into the same space as before, pull up a loop, pull through two, (3 loops left on the hook). YO into the same space as before, pull up a loop, pull through two (4 loops left on hook). Now YO and pull through all 4 loops. If you want your bobbles to be thicker or more pronounced, you can keep working more double crochets into the same stitch, working DC4TOG or DC5TOG. (I wanted the ones for my blanket to be more subtle, so I did DC3TOG). ROW 1: With White, SC in the 2nd chain from the hook and CH 1. Skip one chain, then SC, CH 1. Skip the next chain and continue the pattern of SC, CH 1, SK 1 all the way across. Your last stitch in the final chain should be a SC. CH 1 and turn. ROW 2: SC into SC of previous row, and CH 1. Skip next CH, SC in next SC of previous row, and CH 1. Repeat across. Your last stitch should be a SC. CH 1 and turn. ROW 3-6: Repeat row 2. On the last stitch of row 6, pull through with Pale Green. ROW 7: (Bobble row) SC in first SC, CH 1. *DC3TOG in next SC space, CH 1, SC in next SC of previous row, CH 1*, repeat ** across. CH 1, turn. ROW 8: *SC in first SC, CH 1, SC into top of bobble stitch, CH 1*. Repeat ** across. (In other words, you are working SC, CH 1 in every other stitch). On the last SC, pull through with Soft Grey. CH 1 and turn. ROW 9: (Bobble Row) Repeat instructions for row 7. ROW 10: Repeat instructions for row 8, and pull through with Terra Cotta at end of row. ROW 11: (Bobble Row) Repeat instructions for row 7. ROW 12: Repeat instructions for row 8, and pull through with White at end of row. Then repeat row 2, working 6 rows of mesh stitch in white before working 3 rows of bobbles again. A few things to remember – the bobble row will always be done so the bobbles pop out on the right side. There is a right side and wrong side to this blanket. You’ll know you might have done one too many rows of mesh stitch if your bobbles are popping out the wrong way. 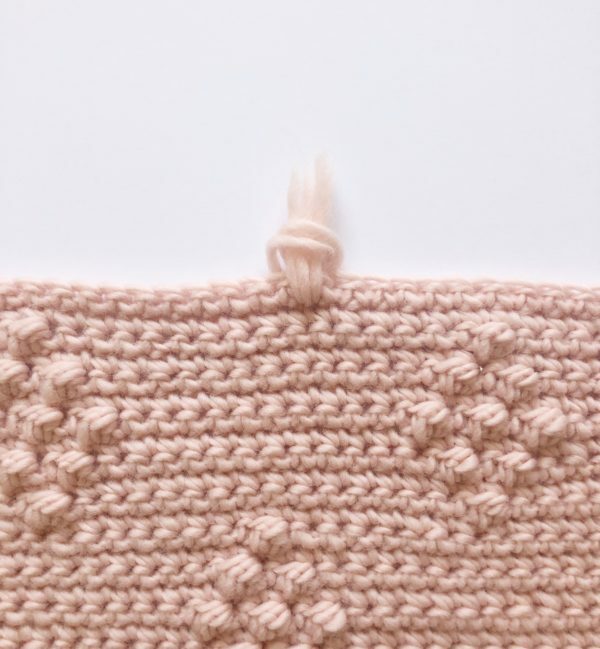 Remember that you will always do a row of mesh stitch in between the bobble stitch row so that you are doing them on the right side. Take two to three pieces of yarn (depending on how thick you want your tassels) and fold them in half. Insert the folded end into the chain space above the last row of single crochet. And that’s it! For the mesh and bobble blanket, I think I ended up putting a tassel in every other stitch on the ends, but you can space yours out however you desire. You can also make the tassels longer by using a bigger notebook, or trim them down if you want them to be shorter. Thanks so much for coming to visit, I hope you enjoy making this crochet mesh and bobble blanket! If you are on Instagram or Facebook, please let us know when you finish your project, we’d love to see your creativity! You can post your picture to the Daisy Farm Crafts Facebook wall or using the #daisyfarmcrafts on Instagram!